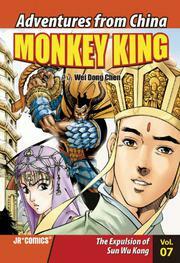 The Monkey King comics need to be read as a series. This assertion will surprise anyone who starts with Volume 7, as the story couldn’t be more self-contained: The Monkey King fights monsters and wins. Readers who started at the beginning of the series, though, will be shocked at Sun Wu Kong’s transformation. He was an untamable rebel, and now he’s a loyal disciple of the priest San Zang. He’s so loyal that he continues to guard his master’s life even after San Zang has banished him. The Monkey King may have been tamed, but nothing can stop him from fighting monsters—even when the monster is disguised as a young woman offering food or a prayerful old man. The monsters are, as always, the best part of the story. There’s a dragon with two heads and a dragon who looks like a horse. But the scariest creature of all is the White Bone Goblin. She’s a masterpiece of design, with long, twisting horns and an outfit made of human bones. Younger readers will crawl under the bed. The Monkey King books can be read as a portfolio of demons and dragons, or they can be read as a psychological study of someone gaining wisdom and compassion.